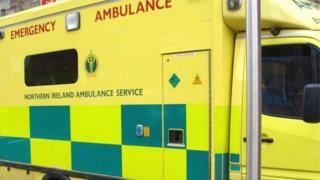 The number of physical assaults on paramedics in Northern Ireland's north west is at a five-year high, according to ambulance service figures. There have been 21 physical attacks on Northern Ireland Ambulance Service (NIAS) staff in the Western Trust area since the start of the year. Ambulance staff have also been verbally abused on 19 occasions in 2017. Shane Devlin, NIAS chief executive, said it was unacceptable that staff should be assaulted or abused. He told BBC Radio Foyle there were a range of measures in place to cut the risks to staff, but ultimately crews were forced into "environments that cannot be controlled". "In many cases people will be under the influence of alcohol or drugs," he said. He said the law should always serve as a deterrent. "Ultimately, if staff are assaulted or abused, as chief executive to the Northern Ireland Ambulance Service, I will always call for a custodial sentence." Valerie O'Neill was assaulted more than 10 years ago in an incident in Castlederg, Co Tyrone, that she said left her traumatised. "Afterwards, the impact is awful," she said. "It was just horrible and for months I could not sleep. I did not feel I wanted to go back to work but thankfully that feeling faded. "It is very sad these incidents are still ongoing, perhaps it is the case that there is no proper deterrent in place," she added. Meanwhile Londonderry's district judge Barney McElholm said perpetrators do not "consider the sentencing guidelines before deciding how hard to punch the paramedic who's treating them". He said education and improved parenting "might go further towards curing this problem". "One can see that better parenting is a very important issue here and unfortunately where children go wrong, it's where the parenting is not adequate," he added.